It has been an exciting start as we prepare to open the new Core Scanning Facility at the National Geological Repository (NGR) in Keyworth, Nottinghamshire, UK, for business in late-summer 2018. 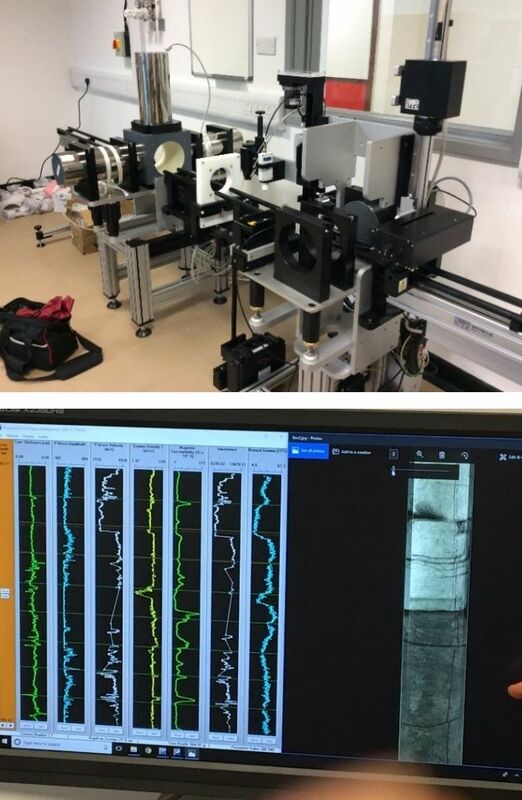 Funded by the Natural Environmental Research Council (NERC), the UK Geoenergy Observatories (UKGEOS) allocated £1.4 million to create a state-of-the-art core scanning facility equipped with four high-resolution and automated core scanner systems for core imaging and non-destructive core analysis. With these new capabilities whole, split, or slabbed rock and sediment cores can be continuously scanned to provide initial information on the geophysical, mineralogical, and geochemical characteristics of the core, record core quality and fundamental variations downcore, and allow high-definition optical, near-infrared (NIR), ultraviolet (UV), and X-radiographic images to be taken. These techniques minimise the need for destructive sampling and will enable scientist to target specific areas of interest for effective sub-sampling procedures. Once up and running, the NGR Core Scanning Facility will not only give UKGEOS the opportunity to facilitate world-leading research into UK’s sub-surface environment (read the science plan), but also will allow scientists, academics and commercial companies to add significantly to their general drill core data acquisition and exploration procedures. Compared with traditional analytical methods, these approaches greatly reduce the time, cost, and destructive nature of sampling. Why slab it, when you can scan it! BGS takes great pride in purchasing from two market-leading analytical equipment suppliers: Geotek Ltd and Cox Analytical Systems; both renowned for their cutting edge technologies that greatly contribute to scientific- and industrial-based applications. 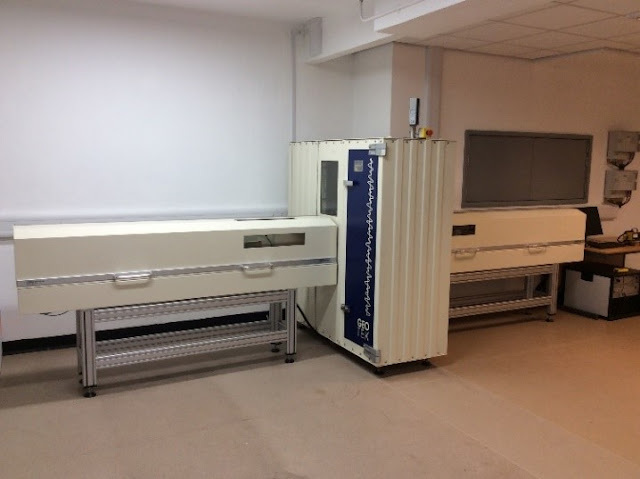 Geotek Ltd. delivered the first two core scanners (MSCL-S and -RXCT) to the newly refurbished core scanning facility on 26th March 2018. Heavy instrument parts, weighting up to 1.3- ton, were carefully manoeuvred through the narrow corridors and installed by the experienced team. 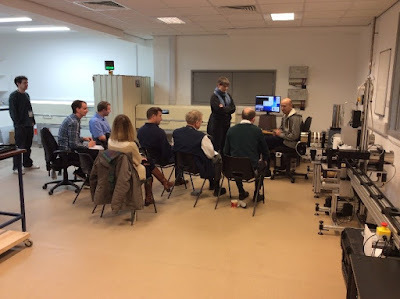 Afterwards, BGS staff members were trained to understand all the components and system parts, and on how to use the software to acquire, process and manage data. We will be using the MSCL-RXCT to visualise and record internal structures present within the core to determine core quality, heterogeneity, and fracture network. The rotating source-detector assembly allows linear and rotational scans to be realised, which makes it a valuable tool to users who wish to extend from general 2D X-Ray radiographic core imaging to 3D X-Ray CT reconstructions. A digital rock software package (PerGeos) will help users to visualize, process, and rapidly interpret the digital core imagery. The MSCL-S will be used for ultra-high definition core images and geophysical analyses, including gamma density, magnetic susceptibility, non-contact electrical resistivity, P-wave velocity, colour spectrophotometry (including NIR), and natural gamma activity. Looking ahead, the delivery and installation of the COX Tray Scanner and Geotek MSCL-XYZ will be expected to take place at the end of June 2018. Special thanks goes to the BGS Facility Management Team who completed reconstruction and enhancement of the existing facility, as well as the BGS Systems and Network Support Team who managed network connection, data storage and any other organisation needs.